Introduction: The profitable and expansive Star Trek franchise (with bigger budgets and the widescreen's advantages) was spawned from an original 3-season TV series that debuted in September of 1966. The original crew's journeys into space didn't end in 1969, but continued on with six films beginning 10 years later, from 1979 to 1991, headlined by William Shatner and Leonard Nimoy as Admiral Kirk and Captain Spock respectively. After that came a new TV series in 1987 (Star Trek: The Next Generation) for seven seasons that also generated another series of four theatrical Star Trek films beginning in 1994 with the Next Generation crew anchored by Patrick Stewart as Captain Picard. After the disastrous Star Trek: Nemesis (2002), the franchise was rebooted or relaunched in 2009, with director J.J. Abrams at the helm, beginning with Star Trek (2009), and followed by the sequels Star Trek Into Darkness (2013) and Star Trek Beyond (2016). The film opened in the year 2271 with a massive bluish cloud, a vast energy-power field of some kind, threatening and destroying three alien Klingon warships; monitoring com station Epsilon 9 reported to Starfleet headquarters in San Francisco Bay, Stardate: 7410.2. that the intruder cloud was "on a precise heading for Earth." A newly redesigned and refitted Federation starship, the dry-docked USS Enterprise, came under the command of promoted Captain James T. Kirk (William Shatner) who was now Admiral; he demanded the untried and unreadied ship to leave hastily in 12 hours, due to an order to intercept the "alien object of unbelievable destructive power...less than three days away from this planet"; Kirk replaced and demoted a disgruntled Willard Decker (Stephen Collins) as Captain of the Enterprise to executive officer (and temporary science officer after a malfunctioning transporter accident); as Epsilon 9 was reporting on the size of the cloud, it was also destroyed. When the Enterprise launched and went into "warp speed" in deep space, it was caught in an artificial wormhole due to its improperly calibrated engines (an "engine imbalance"). 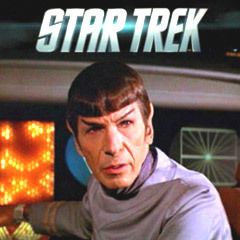 Unemotional, half-Vulcan Spock (Leonard Nimoy) arrived to serve as the starship's science officer; Spock suspected that there was a consciousness (a "highly advanced mentality") and an "object at the heart of that cloud"; when the Enterprise approached close to the cloud, the ship was weakened by the entity's enormous strength - ("a form of plasma energy") and Lieut. Ilia (Persis Khambatta) was abducted after a probe - a shaft of white light, entered the bridge and intercepted her after accumulating all of the ship's data from its computers; the Enterprise was caught in the alien's tractor beam, with Spock reasoning that they were being examined with "insatiable curiosity"; all the Enterprise's scans were reflected back and the sensors were useless, as the starship moved closer to an inner chamber - "part of the vessel's inner mechanism". Ilia soon returned as a robotic android (or mechanical doppelganger) to study the crew for the cryptically-named V'Ger - "programmed by V'Ger to observe and record normal functions of the carbon-based units infesting USS Enterprise" - the android was "a mechanism, a probe...a sensor-transceiver combination recording everything we say and do"; according to the robot, the human crew member Ilia no longer functioned (or was killed), and V'Ger was traveling to Earth ("the third planet of the solar system directly ahead") "to find the creator, to join with him...V'Ger and the creator will become one...The creator is that which created V'Ger...V'Ger is that which seeks the creator"; Spock surmised that Ilia's memories had also been replicated, meaning "her feelings of loyalty, obedience, friendship might all be there" - therefore, the probe might be "the key to the aliens" - if those memories could be revived through its remembered romantic association with Commander Decker in a former relationship - this could help the crew make direct contact with V'Ger, but concern arose when the android said: "all carbon units will be reduced to data patterns". Spock took an unauthorized jet-pack "space-walk" to attempt to directly contact the aliens and get a view of the interior of the alien spacecraft - and noticed a representation of the alien's home planet; he saw an intricate imaging system that held images of "planets, moons, stars, whole galaxies all stored here, recorded. It could be a representation of V'Ger's entire journey...we are inside a living machine...a conscious living entity"; he attempted a fearful "mind-meld" with the cold, logical organism that didn't succeed when it short-circuited, and he was diagnosed as suffering "neurological trauma" when he was brought back to the Enterprise; Spock described what he did learn, however - V'Ger "has knowledge that spans this universe and yet with all its pure logic, V'Ger is barren, cold. No mystery. No beauty"; V'Ger appeared to be asking questions, such as: "Is this all that I am? Is there nothing more? "; V'Ger was attempting to communicate with its creator on Earth (a machine), using a simple radio wave; Spock explained: "V'Ger is a child...evolving, learning, searching, instinctively needing...It knows only that it needs, Commander. But like so many of us, it does not know what". Kirk refused to disclose vital information to V'Ger that it thought it needed about why the creator was not responding, causing it to have a "tantrum" and threaten destruction - Kirk bluffed and bargained with V'Ger to remove all the destructive orbiting devices around Earth if the Enterprise could communicate with V'Ger directly (instead of through its android probe); the bluff worked as the Enterprise was tractor-beamed into the center of the cloud-vessel where its transmitter was located ("a vital link between V'Ger and its creator"); to fulfill itself, V'Ger wanted to add Humanity to its experiences, as Spock had explained with a tear in his eye when reminded of his own past heartlessness: "V'Ger hopes to touch its creator to find its answers". To Kirk and a few other crew members, it was revealed that V'Ger was formerly the unmanned scientific space probe and data-collecting transmitter named Voyager 6 that was launched by NASA from Earth in the 20th century (with a mounted plaque that read VOYAGER VI) more than 300 years earlier; after disappearing into a black hole, it crash-landed on a planet inhabited by an alien race of living machines, was rebuilt with a new surrounding vessel (the cloud) to house V'Ger, and reprogrammed to continue collecting data and returning that information to its creator NASA on Earth - "on its journey back, it amassed so much knowledge, it achieved consciousness itself. It became a living thing"; however, its old transmission Voyager response code no longer could be answered by Earth; Kirk asserted: "We are the creator" and proposed for V'Ger to complete its transmission but V'Ger wouldn't allow the code to finish its final sequence; V'Ger insisted that the creator "join" it to allow it to fully evolve. In the stirring conclusion, human-being Decker offered himself up to physically merge with V'Ger (symbolized by uniting with its android probe Ilia) to provide a "human quality" - to merge man and machine; the merging took place in a dazzling, explosive shower of white light, creating a new glowing alien entity or non-corporeal life form ("We witnessed a birth. Possibly a next step in our evolution") from which the USS Enterprise emerged - unscathed for its next mission. The first film of the original series. This film was the result of Paramount Pictures' cancellation of a second Star Trek TV series in the late 1970s. The show's creator, Gene Roddenberry, took the program's 1977 two-hour pilot "In Thy Image" and adapted it into this big-budget theatrical feature. Nominated for three Academy Awards (with no wins): Best Art Direction, Best Original Score, and Best Visual Effects. With a production budget of $35 million, and box-office gross receipts of $82 million (domestic), and $139 million (worldwide). One of the more ponderous films in the series, with a lackluster villain. Great Scene(s): The USS Enterprise revealed in dry-dock during a fly-by, the transporter accident, the "wormhole" near-disaster, Mr. Spock's jet-pack 'space walk,' and the finale's dazzling light-show "merge" between Decker and android Lt. Ilia.